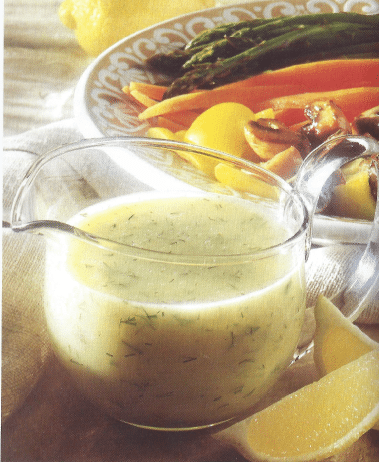 Lemon and dill combine to make a refreshing sauce for steamed vegetables, roast chicken or baked fish. In a medium-sized saucepan, bring the stock to the boil over moderately high heat. Lower the heat, stir in the corn starch mixture and simmer, stirring occasionally, for 5 minutes. In a small bowl, whisk together the egg yolk and lemon juice. Whisk in 1/2 cup of the hot stock, then pour the mixture back into the saucepan, whisking constantly. Simmer, whisking, for 1 minute (do not allow the sauce to boil or curdle). Stir in the dill. Makes 1 1/2 cups of sauce.